Combine grapefruit juice and champagne in a medium saucepan, sprinkle with gelatin. Allow gelatin to soak for a minute or two. Heat over low heat, stirring carefully and constantly, until gelatin is dissolved (approximately 5 minutes). Remove from heat. Stir in St. Germain. Refrigerate until fully set (several hours or overnight). To serve, cut into shapes and garnish as desired. Makes 24-30 shots. Spring is, well, springing, and my thoughts turn once again to elderflower liqueur, a spirit that has been the darling of many a cocktail menu for the past few years. If you haven’t tasted elderflower liqueur, you are in for a treat – it’s a bit floral and a bit fruity at the same time – perfect for warm weather, and for Girly Drinks. I concocted the recipe for the French 78 Jelly Shots with my sister, Amy (also an aficionada of the Girly Drink), as a lighter warm weather rendition of the brandy, lemon and champagne-based French 75 we enjoy in the fall and winter. For the 78, we keep the champagne, but swap out the lemon and brown liquor for fresh grapefruit juice and elderflower liqueur. I made our recipe into a jelly shot for an article about Jelly Shot Test Kitchen run by a local magazine, an article which led to many wonderful things, including the relationship with Tablespoon.com! 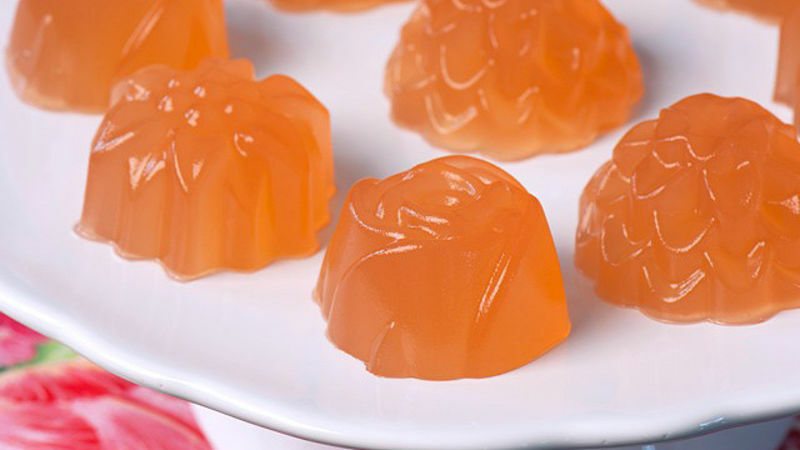 I most often make these jelly shots in a standard 9” x 5” glass or non-reactive metal loaf pan, cut them into cubes, and top with edible flower petals. The floral shapes are a fun alternative for a garden party or other festive occasion. To make the jelly shot as pictured, I used floral shaped metal cake molds. These are much easier to unmold than the large size gelatin salad, but still take a little work. First, gently loosen the edges of the gelatin with your fingers. Dip the bottom of the mold pan into warm water for ten seconds. Invert the pan on non-stick cookie sheet or plate. Give the mold pan a brisk shake. The jelly shots should release, if not, pull gently again on the gelatin.